Located around 15 kilometers west of Sosúa, Cabarete is an artificial city which dedicates itself to surf, wind surf, kite surf and other aquatic sports and also long party nights. 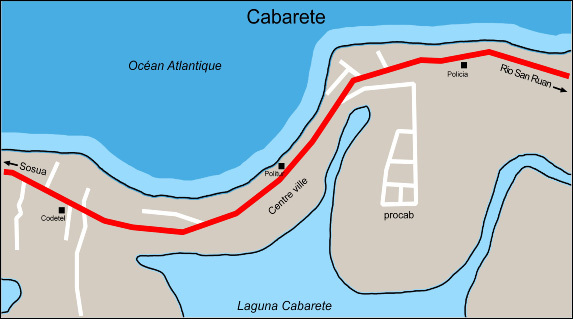 The center of the city is located between the ocean and the main road. Cabarete is primarily made up of hotel,discotheque's, bars and restaurants, the city of cabarete can seem to a artificial creation of the Dominican republic, it is a touristic zone where the prices can be a bit higher than in the rest of the country. There are many tourist and residential foreigners that it could seem like you in Europe (except for the turquoise ocean and the coconut palms), there still are Dominicans but they live outside the center of the city. The main attraction of cabarete you can find along the 4 kilometer beach full of coconut palms and it is still one of the world known spots for surfing and kitesurfing which was invented by two french, kitesurf is where you surf with a sail. the ambient of the city is young, sportive and the long party night are hot. One of the main activities is Kitesurf, and windsurfing thanks to its environment and the regular wind which blows along the whole beach, which makes this the perfect place for kitsurfers.There are two surfing "spots" in cabarete where the windsurfers and kitesufers can choose to go. There are many Kite and surf schools located in cabarete even fun board. So everybody who comes for vacation can give it a try and is wellcome. Private lessons with a professional are possible according to your level. The second bigest attraction in cabarete is the nightlife, next to the ocean there are located the bars where you can listen to the music to the maximum and where the young sportsmen meat for the night. The city of cabarete can be fun for partying but you can also enjoy cabarete simply by relaxing on the beach and bathing , during the evenings and the nights the lighted coconut palms, marvelous lobster and your feat in the sand make cabarete a magical place to spend an evening. Nice hotel in Cabarete with 6 bungalows fully equipt small kitchen, livingroom. The bar located next to the magnificent pool is for disposition to the clients. A simpatic ambiance, nice view, 5minutes from cabarete beach, this is a ideal location to spend your vacation in Cabarete. the hotel Kaoba is a complex with a high selection of a diversity of rooms, tropical garden, all of this only a few steps from cabarete beach and the center of town, possibility to internet connection, the hotel offers different categories of rooms from economic until first class. Prices are in between 30 until 80 US$ per night depending the season, Breakfast included with the supplement of 3.5 US$. Located in the center of Cabarete, 100 meters from the beach, the hotel cita del sol is a complex with 47 apartments including each one with a bedroom, kitchen, cable television(70channels) and telephone.The prices are from 50 until 60US$ per night for simple or double. If you need more information about these hotels please contact us. The restaurant Lax is located in the center of cabarete. A big selection of meats, pizza... It isn't a gastronomic place but the decorations are very nice. You can eat under the palms , enjoying the beach of cabarete and have your feet in the sand. The ambiance is fun and young, you can count the dinner around 15 US$. The restaurant Le Coco Rico is located on the main road Cabarete, you can find it easily because of its large luminous sign. The specialty of the restaurant is the chicken, but they also offer other plates like "beef bourguignon", lenses stew with bacon, lasagna... the Coco Rico has a nice ambiance, the food is well served and with quality, you can count a meal around 7US$. To spent an evening in Cabarete is very easy going, just let yourself be led by the music, while you take a walk along the beach you ll find a variety of different bars and restaurants, for example two famous bars Omno´s or the Bambú Bar which offer more electronic music which isn't that typical. In general the nightlife of cabarete is an ambiance of sport and touristic, not really typical Dominican but still very Latin hot. you can also find a lot of moto conchos (motorbike taxis) in the city which practically take you everywhere. But watch out because in the city you'll have to negotiate the price before you go on a moto concho or before you take any public transportation and avoid paying in dollars or other foreign money, because if you do they have the bad habit to charge you more. Numerous Banks in the city of cabarete are to your disposition with ATM machines, so you don't have to get nervous in that case. A variety of souvenir shops and clothing shops are along the main road of cabarete. You can also find a supermarket along the mainroad which has good prices and where you can find various things. There are some internet cafes in the center of the city which also offer long distance phone calls to very good prices.